"Visualizing Japan (1850s–1930s): Westernization, Protest, Modernity"
and John Dower of MIT (right), the course looks at Japanese history and the skills and questions involved in reading history through images now accessible in digital formats. In 2014, Visualizing Cultures' content and image-driven approach was made into a MOOC (Massive Open Online Course) in a first-time collaboration between MITx and HarvardX: "Visualizing Japan (1850s–1930s): Westernization, Protest, Modernity,” or VJx. The course ran Sept. 3 to Oct. 22 with discussions, polls, and word clouds. 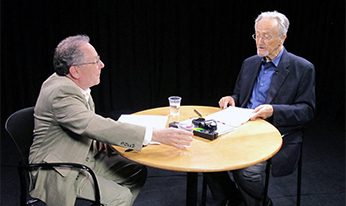 Detailed scripting by Professors John W. Dower (MIT) and Andrew Gordon (Harvard), with lead content developer Ellen Sebring (MIT), gave an image-driven structure to the online lectures and courseware. This co-taught course looks at Japanese history and the skills and questions involved in reading history through images now accessible in digital formats. The introductory module considers methodologies historians use to “visualize” the past, and is followed by three modules that explore the themes of Westernization (in Commodore Perry’s 1853–54 expedition to Japan), social protest (in Tokyo’s 1905 Hibiya Riot), and modernity (as seen in the archives of the major Japanese cosmetics company, Shiseido). This is a past/archived course, but an archived version of VJx can be taken at any time (click here). Certain features may not be active, but many people enjoy watching the videos and working with the materials. At this time you can only explore the course in a self-paced fashion, but make sure to check for reruns of VJx. Visualizing Asia is a series of content-driven conferences, in association with MIT Visualizing Cultures, in which scholars from diverse institutions and disciplines discuss the theory and practice of image-driven scholarship, and present topics based on the visual record of 19th- and 20th-century East and Southeast Asia. 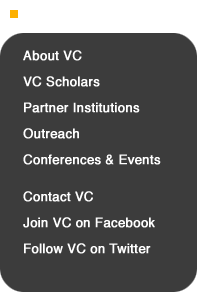 Conferences have been held at Yale University in 2010, 2013, and 2015; Harvard University in 2011; and Princeton University in 2012. Peter C. Perdue at Yale University. Non Arkaraprasertkul, Visualizing Romance of Shanghai Neighborhood: The precursory experience and how do we know what we thought we knew? The Visualizing Cultures project at M.I.T. 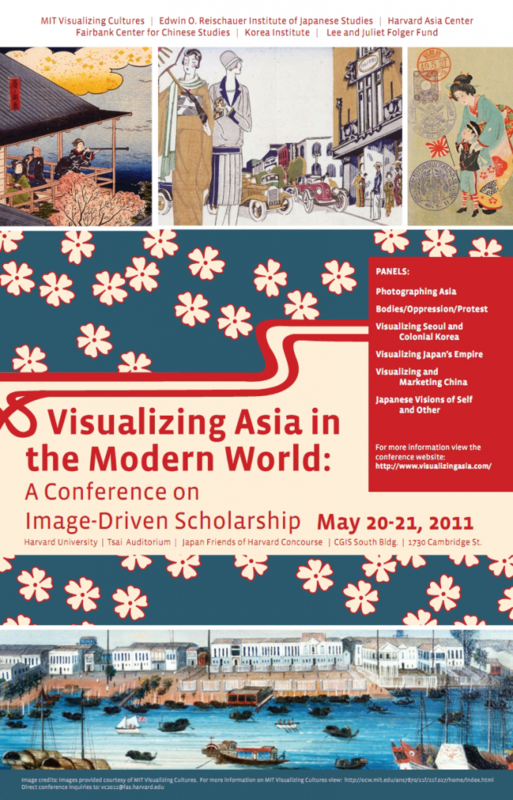 and the following programs at Harvard: Asia Center, Fairbank Center for Chinese Studies, Korea Institute, and the Reischauer Institute of Japanese Studies are pleased to announce an academic conference focused on the relationship between visual imagery and social change in modern Asia entitled, “Visualizing Asia in the Modern World.” This will be the second in a series of academic conferences devoted to “image-driven scholarship” and teaching about Asia in the modern world. We have selected scholars of history, art history, history of photography, and history of technology specializing in China, Korea, Japan, United States, and Europe to discuss how to integrate visual and textual media in research and teaching, using to the fullest the opportunities presented by the new technologies and the use of the internet as a publishing platform. Sucheta Mazumdar, Duke University, "Opium and Asia: One Drug, Many Histories"
Lillian Li, Swarthmore College, "The Summer Palace"
Peter C. Perdue, Yale University, "Graphic representation of the Boxers around the world"
Robert Bickers, University of Bristol, "Graphic representation of the Boxers around the world"
Ellen Sebring, MIT Visualizing Cultures, "The Boxer Uprising Media Storm"
Chang Tan, Harvey Mudd College, "Panasianism in Art"
Lisa Claypool, Reed College, "China in the 1903 Osaka Exposition"
Jack Tchen, New York University, "Asian Americans and the Yellow Peril"
Hyung-il Pai, UC-Santa Barbara, "Visualizing 'Antiquity' and Marketing Archaeological Tourism in Colonial Korea (1910-1945)"
Christopher Capozzola, MIT, "Photography and Power in the Philippines"
David Hogge, Smithsonian Institution, "Photography and the Empress Dowager"
Wen-shing Chou, UC-Berkeley, "The Empirical and the Visionary in the Life of the 13th Dalai Lama"
Rebecca Nedostup, Boston College, "Shanghai"
John A. Crespi, Colgate University, "The Graphic Imagination of Shanghai’s Modern Sketch (Shidai Manhua), (1934-1937)"
Anne Kerlan-Stephens, CNRS, France, "Death of a Woman, Birth of a Movie Star — Ruan Lingyu (1910-1935)"
Li Danke, Fairfield University, "Women and physical culture in the Qing and Republican periods"
Theodore Bestor, Harvard University, "Edo/Tokyo"
Samuel Morse, Amherst College, "Tokyo"
Christopher Gerteis, London SOAS, "The Ohara Institute and post-1945 labor protests"
Andrew Gordon, Harvard University, "Labor movements before 1945"
In January 2007 a colloquium of Visualizing Cultures scholars and advisors took place in Cambridge, Massachusetts, where scholars shared ideas and research related to the project and their contributions. On May 6, 2006, Visualizing Cultures and the Five College Center for East Asian Studies held a teachers conference in MIT’s Stada Center. This day-long workshop, attended by more then 90 area teachers, was a collaboration of Visualizing Cultures and Kathleen Woods-Masalaski, director of the Five College Center for East Asian Studies at Smith College. The focus of the workshop was Visualizing Cultures and the curriculum, but it also included presentations by other teacher resource groups working with VC including the Museum of Fine Arts, Boston; Primary Source; and, from Yale, PIER. John Dower presented a pedagogical overview of Visualizing Cultures and spoke to the myriad of resources available to teachers on the website including the VCID database and VCTV video resources. The afternoon sessions included concurrent workshops featuring the Visualizing Cultures curriculum where all teachers were able to work hands-on with the new VC curriculum. Exit surveys were conducted asking the teachers their thoughts regarding the content and if they felt they could include the curriculum in their lesson plans. Of the 90 surveys collected there were 89 positive responses. On November 17–20, 2005, the National Council for the Social Studies held its annual conference in Kansas City, Missouri. This yearly gathering brings together over 5000 social science teachers from the United States for four days of peer exchange, workshops, and seminars. Each year the NCSS receives as many as 1000 proposals for inclusion in the conference program. Visualizing Cultures and the Black Ships & Samurai curriculum, developed in collaboration with Lynn Parisi, director of the Teaching East Asia (TEA) program at the University of Colorado, were selected as part of the NCSS program. Lynn and several teachers in her TEA program presented the Visualizing Cultures curriculum for the Black Ships & Samurai unit in a two-hour workshop. Teachers took part in actual lessons and classroom exercises. Afterwards, they discussed how they would employ Visualizing Cultures in their lesson plans, and how the curriculum addressed national standards. Scott Shunk, Program Director for Visualizing Cultures, presented an overview of the project and discussed with teachers what types of content, technology, and additional curriculum would be available from Visualizing Cultures in the coming months. Over 40 teachers attended the workshop and had an overwhelmingly positive response when asked about the content and the curriculum’s application in their classrooms. Three of the teachers who attended the workshop have become field testers for the project. Additionally, TEA will keep in contact with these teachers and many others they work with in similar workshops and provide periodic updates as Visualizing Cultures introduces new content and curriculum. Visualizing Cultures has been nominated to do a half-day workshop for the 2006 NCSS conference to be held in Washington, DC, in December, elevating it to a featured presentation. In May 2005 the New England regional conference of the National Council for the Social Studies held its annual event. John Dower and Scott Shunk presented the Ground Zero 1945 unit as a keynote seminar to over 150 teachers in attendance. Visualizing Cultures was featured again as part of the NERC event held in March 2007 bringing together over 500 regional social science teachers.